Around the world, more than 263 million children and adolescents are out of school. For many of these children and youth, the formal schooling system may no longer be a viable option. Accelerated Education is an alternative. Accelerated Education Programs (AEPs) are flexible, age-appropriate programs run in an accelerated timeframe that allow those who have missed out on education to catch up. The goal is to provide learners with a basic education that is certified and equivalent to the formal schooling system. 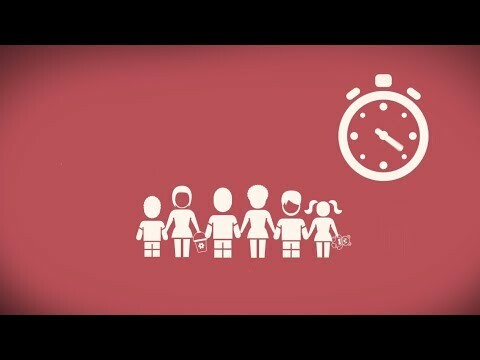 Check if Accelerated Education could be a solution in your context. Consult this one-page decision-making tree (available also in French, Arabic, and Spanish). This website provides a comprehensive collection of information about Accelerated Education, as developed by the Accelerated Education Working Group. You will find valuable tools, guidance notes, reports, and case studies as well as multimedia resources in which experts discuss what works best and how to design, adapt, and implement an AEP. The Accelerated Education Working Group (AEWG) is comprised of education partners working in Accelerated Education (AE). It is currently led by the United Nations High Commissioner for Refugees (UNHCR), with representatives from UNICEF, UNESCO, the United States Agency for International Development (USAID), the Education in Crisis and Conflict Network (ECCN), the Norwegian Refugee Council (NRC), Plan International, the International Rescue Committee (IRC), Save the Children, and War Child Holland. What is the AEWG’s goal and what does it do? The AEWG’s goal is to improve the quality of AEPs through developing guidance and tools to support a more harmonized, standardized approach to Accelerated Education. In recent years, Accelerated Education programs (AEPs) have been employed with greater scope and scale as one of several solutions to the intractable issues of attracting and retaining out of school and overage learners within the formal education system. Yet, widespread variation exists in how AEPs are planned, implemented, and approached, with little or no overarching objectives, guidance, standards or indicators for what effective Accelerated Education (AE) provision looks like. In response to this challenge, the AEWG has made significant investment and efforts to develop a conceptual framework for what constitutes good practice in AE. The development of the 10 Principles for Effective Practice and accompanying Guide to the Principles have created a foundation for improving program quality, design, implementation, and the assessment of results. Please see Resources for all of the AEWG’s tools and guidance. For more details of what the AEWG does, please see the AEWG 2018 brief. To contact the AEWG, please write to Martha Hewison at hewison@unhcr.org. The AEWG has developed a pack of tools and guidance for AE in multiple languages, including English, French, Arabic, and Spanish. The foundation of all the tools and guidance are the 10 Principles for Effective Practice which capture the key components of any AE Program. In addition, the AEWG developed an agreed definition for AE as well as other key program terms, a checklist to help align your program against the Principles and a Guide to the Principles which further details the 10 Principles. When initially developing these materials, the AEWG piloted them in three countries. Detailed case studies from Afghanistan, the Dadaab refugee camp in northeast Kenya, and Sierra Leone as well as an overall synthesis report and executive summary are all included below, in the additional resources. Strengthening the evidence base is a key area of work for the AEWG. Here the AEWG has developed a Learning Agenda for AE, which can also be found below. The AEWG is currently working on a Monitoring, Evaluation, Accountability, and Learning framework, which will be out by the end of 2019. You might also be interested in the slides of AEWG’s 2017 CIES presentations in Atlanta and two blog posts: Making a Case for Accelerated Education: How It Can Be Done and a reflection on AEWG at CIES 2018 in Mexico City, titled Making the Case for Accelerated Education. In addition, the findings from the field studies are available below. The AEWG wants donors and governments to recognize Accelerated Education (AE) as an important strategy for connecting humanitarian, early-recovery, and development programming. The AEWG wants to develop an M&E framework for AEPs that can be adapted to specific program designs, but still have a set of common indicators and outcome statements. Developing a value-for-money case for AE is a critical missing component of the evidence base at present and the AEWG will explore developing this case in 2018. The AEWG will also continue to support and nurture existing and new research partnerships. Improve AE programming through the development, promotion, and dissemination of AE guidance and tools. Activities for Objective 1: Improve international and national AE policy and systems through advocacy. The AEWG advocated to improve AE policy and systems at both the national and international levels through the development of key messages, a policy brief, and engagement plans for donors and ministries of education. The AEWG communicated and promoted key messages through blogs, websites, webinars, and at international education conferences and events. Activities for Objective 2: Strengthen the evidence base for AE through research and knowledge management. The AEWG published its Learning Agenda and established partnerships and conducted research to strengthen the evidence base for AE. If you are interested in doing work linked to these research themes and questions, please register here. This will enable the AEWG to track research and also enable you to see who else is working on similar themes. The AEWG completed a series of studies on the application of the Accelerated Education 10 Principles for Effective Practice. This included four case studies, conducted in Sierra Leone, Afghanistan, and two programs in the Dadaab refugee camp in northeast Kenya, as well as an overall synthesis report and an executive summary. The case studies highlighted how contextual differences are managed in assessing adherence to the principles and in ensuring effectiveness of AE programs generally. Activities for Objective 3: Improve AE programming through the development, promotion, and dissemination of AE guidance and tools. The AEWG promoted and disseminated guidance and tools, including the translation into additional languages of the AE 10 Principles for Effective Practice, AE Guide, and AE definitions, as well as the development of an AE toolbox, containing a how-to guide, AE indicators, log frame, and monitoring tools. We built on the understanding of AE, especially within AEWG member organizations, through the dissemination and use of the tools. All these resources are available in Arabic, English, French, and Spanish, and can be found here. 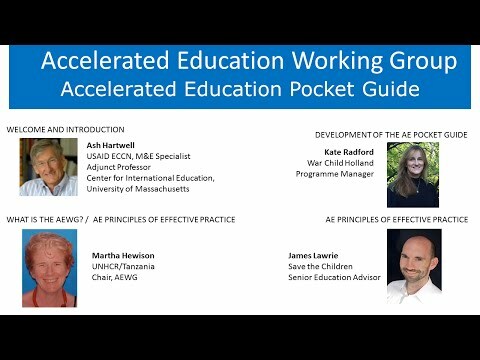 On June 9, 2016, ECCN, in partnership with the Accelerated Education Working Group (AEWG), hosted a webcast that offered a preview of its Guide to the Principles, which features 10 key principles of Accelerated Education. Presenters discussed the development, importance, and potential application of the guide and gave an overview of the principles that underlie the development and implementation of AE programming. Martha Hewison has over 20 years of education experience working for INGOs, donors, and governments in East, West, and Southern Africa, with a particular focus on education in post-conflict contexts and fragile states. Currently she is part of the UNHCR Education team, with a specific focus on supporting Accelerated Education Programs, and is chair of the AEWG. Prior to this, she has worked largely in East Africa (Uganda, South Sudan, Somalia, and Kenya) with a specific focus on education and fragility. James Lawrie, senior education adviser with Save the Children, has 15 years’ experience as a teacher, researcher, policy adviser, and program manager working in numerous conflict, post-conflict, and low-income locations. He has been involved in Accelerated Education Programming in South Sudan, DRC, Bangladesh, and Uganda, and joined the AEWG in 2015. Ash Hartwell has 40 years of field experience working at community, national, and international levels on educational policy analysis, planning, evaluation, and research. He has conducted program and project evaluations in numerous crisis and post-conflict countries, including Uganda, Egypt, and South Sudan. Over the past five years, he completed numerous consultancies, including serving on the core Leader Team for EQUIP 2, focusing on an analysis of alternative education models for underserved populations. Hartwell is M&E Specialist for ECCN and an adjunct professor at the Center for International Education at the University of Massachusetts. He joined the AEWG in 2015. Brenda Bell: What definition of “accelerated” are you using? And where will you give that definition? Often “accelerated” is understood to be merely “fast-paced” rather than using accelerated learning principles that lead to deeper, more meaningful learning. Martha Hewison: One of the things we have been working on since the very beginning is the definition of Accelerated Education. We’ve agreed on this definition, and it should be up on the INEE site very soon. Our agreed-upon definition is “a flexible, age-appropriate program that promotes access to education in an accelerated time frame for disadvantaged groups; overage, out-of-school children; and youth who have missed out or had their education interrupted due to poverty, marginalization, conflict, and crisis. The goal of AEP is to provide learners with equivalent, certified competencies or basic education and learning approaches that match their level of cognitive maturity.” This definition is available on the ECCN website. We also have definitions for catch-up, bridging, and remedial programs. Jim Rogan: What research supports the good practices of the 10 principles? James Lawrie: The original principles were put together in partnership with Sue Nicholson and Save the Children in South Sudan. The development of these principles was informed by a review largely of grey literature, of evaluations and assessments of Accelerated Education Programs. That’s how we formed the original 20 principles. That work was then tested in South Sudan—we reviewed it, looked at how it worked, looked at the elegance of it. It wasn’t research that helped develop it further; it was a series of individuals who knew about this topic and cared deeply about education, who then refined them to get to the state of 10 principles. On one level, no, the principles are not based on peer-reviewed academic research; the field is too slim at this stage. There isn’t enough data—enough research—out there for us to base it on that. There is some good research that’s being done at the moment on Accelerated Education, which will inform the second iteration of this guide and these principles, but these are based on evaluations of programs and the work of experts in this sector who helped form them. Over the course of the next two years or so, there is very much the intention that we do some research, that we do understand the effectiveness of these 10 principles. This might mean some re-framing, it might mean some radical changes; we don’t know. But this is part of the journey, rather than an end destination. Ash Hartwell: The consultant group and the working group have been diligent in surveying the field for quality research and literature that informs this work, but we realize that it’s very difficult to find really high-quality research. It’s one of the agenda items in moving forward for us to use the principles as a basis for generating additional research and assessments. Sarah Press: When selecting 'relevant' language and standards for the education of refugees outside their home country, do we always assume that home-country language and standards are the most 'relevant'? How do we ensure that refugee education aligns with home-country standards? Martha Hewison: When refugees are outside of their country of origin, they should ideally be following the host-country curriculum, if that’s possible. In many refugee contexts, where they’re able to follow the host curriculum, often there is already some form of content curriculum which can be adapted for an Accelerated Education Program. If that doesn’t exist, then you would have to bring in some people to develop an Accelerated Education Program from the national curriculum. In those contexts, where the host curriculum is being used, it is not really problematic to align it with the international education systems. However, as we know, in many refugee contexts, they are following the country of origin’s curriculum. The same applies: we need to look at the country of origin’s curriculum and see if there are any Accelerated Education materials. If not, we need to develop them. Then, the really difficult thing, which actually we are experiencing in several contexts currently, is to try and work with the ministry of education or the national exam body, and, in country, ensure that there is a certified equation of the country of origin Accelerated Education Program with the national system, so that once students complete that, they can then transition into secondary education or another form of education or employment. One of the real challenges we often find is this accreditation equation of host country and country of origin curriculums. It’s very tricky, but it’s something we need to work on with the ministry of education or the relevant education authority. Stephen Richardson: How does the AEWG plan to advocate with ministries of education to accept/adopt said principles in the near future? If so, how can the larger AE community be aware of the progress with said ministries? James Lawrie: It’s on our agenda. We have not talked through a dissemination strategy in depth at this stage. This is part of the dissemination, the beginning of a two-year process to help the intended users of the guide adopt it. The intended users, of course, include ministries of education, district office staff in education, and non-state actors/staff working in this sector as well. It includes many people. The question about ministries of education—through partnerships between a relevant leading non-state actor in that location and the ministry of education itself. Just knowing the South Sudan context, we involved the work of Sue Nicholson; we (Save the Children) partnered with the Ministry of Education in the Alternative Educations Department in South Sudan. We worked together over the period of two years or so. We know that we can influence practice in a positive way, in line with the national priorities, and we can influence the alternative education systems and the accelerated learning programs of South Sudan. By that sort of partnership approach, I think that is how we will embed these principles into the practices of the implementers of Accelerated Education at a national level. I also think we can share the documents, we can do presentations, we can communicate. If we rally the international community, if we can influence people and let people know that this is a useful tool to help improve the quality of Accelerated Education, then we’re hoping those people will be talking with ministries of education. Ash Hartwell: I think Stephen and others who asked this question recognize that there are an increasing number of governments that do recognize Accelerated Education within their sector strategy, and hopefully by establishing guidelines and standards, having INEE behind this, more and more governments and agencies will begin to figure out how to embed this within sector policy and practice. Tracy: How should AEP be financed and sustained? Ash Hartwell: Our expectation is that over the next five years we will see more and more governments, even in fragile states, and agencies begin to see Accelerated Education as a critical component within an overall sector strategy. Therefore, it should be financed through that sector strategy, using funds that could become available, if they could be raised for the Education Can’t Wait initiative, as well as GPE and other sources of sector financing. We also caution that agencies and organizations should not start programs that they cannot see through two or three years. The fragmentation of existing programs, where programs start and stop, has been a real disservice. Carl Triplehorn: Is there a Do No Harm philosophy in the principles? Often there is a tension between Accelerated Education and formal schooling, as trained teachers are attracted to Accelerated Education Programs, due to regular pay and resources, or they take both jobs and are overworked. Martha Hewison: I don’t think that overtly it’s in the principles, and I think that’s a very good point, and we probably need to put that in. We think of these as not finalized. Under each principle there are several bullets. For example, under principle five and principle six, which are all about educators, we talk about recruiting educators from target geographic areas; ensuring gender balance; building on learners’ culture, language, and experience. In that sense, there is a little bit of Do No Harm, but I think we could be more explicit with it. Ash Hartwell: Yolande Miller-Grandvaux made a comment on her experience in Liberia, where she points out that in many cases, regular teachers also do double duty as Accelerated Education teachers and get burnt out. This is a really important principle in looking at the teachers and other staff connected with Accelerated Education. The whole teacher support system and recruiting and use is a vital issue. We may, in the next versions of the guide, put a little more focus on that, though it does get reflected in two of the principles we have. Andreas: How are the 10 principles aligned with the INEE Minimum Standards? James Lawrie: At this stage, I’m now realizing that we haven’t done a decent analysis of the alignment between the Minimum Standards and the guide. From what I know about both documents, there is a great deal of alignment. The Minimum Standards of course are more comprehensive, and they cover more elements. The Accelerated Education guide is more specific to one particular form of education. I would be surprised if there is any real difference or divergence in what they’re saying, but I can’t offer you a decent answer and say, “Yes, we’ve done an analysis, and the alignment is here, here, and here,” because I don’t know that that’s the case. Ash Hartwell: That’s a very useful comment, Andreas, and we will take it to heart and be more explicit as we go forward that the principles do align with the INEE Standards. All of us are aware of those standards, but we haven’t explicitly shown how they’re aligned. Jeanne Moulton: How do you avoid duplicating and/or drawing resources away from the formal system? Kate Radford: It’s obviously a natural tension that does exist in terms of Accelerated Education and formal systems. I think what we are being very clear about in the Working Group is that one of the aspirations of Accelerated Education is to allow a transition back into the formal system when the formal system is available, and also to ensure that children are in a position to take advantage of the formal when it’s available. So, I don’t necessarily see it as a drain on resources, but more a way to ensure that the formal system has a better chance of being successful and being able to provide the type of education that children need, whereby children who are overage get a chance to be able to perhaps transition in at a more appropriate time for themselves. I don’t think there’s any easy answer, because there are limited funds anyway. We’re not awash with funds in the sector, and certainly not in the humanitarian sector for education. But I think being very clear about the fact that Accelerated Education has the aim of getting children back into school eventually, where it can, is one of our principles. Ash Hartwell: I think the issues have already come up, which are Do No Harm and the fact that sometimes teachers are drawn from the formal system because of the attractiveness of the salaries that are provided in the Accelerated Education Programs, which are usually funded by donors, agencies, and NGOs, so it can definitely be a problem. I think the principle of Do No Harm here, and looking at the relationship between Accelerated Education and the formal system, are really important in designing and managing these programs. One of our fundamental principles though is that these programs are designed for children who are overage in relation to getting back into the formal system, and in research recently carried out in the DRC, we’ve seen many older children and youth who would like to get back into the system, but they are too old to be able to do that, so this is where Accelerated Education really plays an important role. Carl Triplehorn: Does the AEP research draw upon the alternate diploma programs in developed countries, such as the GED test in the United States? This would help to demystify what AEP is and how it fits into many education systems. Martha Hewison: No, we haven’t. But again, I think that’s something that, along with Andreas’s comment and looking at the INEE Minimum Standards and comparing them to our principles, and also with the Do No Harm approach—I think that’s something we can definitely look at. But the answer is no for the time being. Ash Hartwell: The answer is no, but not a completely unequivocal no, in the sense that when we were doing the review of literature, some of the literature on Accelerated Education really arose in the United States and in Europe to examine ways in which overage children and youth who wanted to get equivalency would do that. The term “Accelerated Education” was originally born out of that experience. So there’s a strong and long history of the use of the term for that purpose. Its always difficult having multiple ministry’s supporting one programme. My only suggestion is to encourage and foster close collaboration and coordination- potentially setting up an AEP working group with representatives from both ministries. In the initial design of the AEP if you know that it is under more than one ministry ensure that both are there and involved in the design and attempt to encourage splitting of responsibilities and developing some kind of joint MoU for the AEP. I am curious about the struggle learners in the classroom. Is there any way to help them? Also I am interested to know about sustainability of the AEP program. AEP learners struggle for a variety of reasons but one reason is that because they have missed out on parts of their education or indeed never been to school they lack the foundations, the basics. In the 10 AE Principles under P1 ‘AEP is flexible for older learners’ we recommend age-appropriate introductory level course for learners who have never been to school to improve readiness skills. We also mention it again under P4 ‘Prioritize the acquisition of literacy and numeracy skills as the foundation for learning’. We also stress the importance of flexibility of class time, and location, as required by the community, teacher, and above all, the specific needs of both male and female learners in order to ensure consistent attendance and completion. Under P4 we talk about the curriculum being age appropriate and using a relevant language of instruction too and under P7 the involvement and support of the local community. Under P8 we talk about the learning environment being safe, inclusive and leaning ready. So there are several ways we can help and support learners in the classroom which we have included under the principles. We also mention the importance of sustainability under P10 ensuring that goals, monitoring and funding align and that an exit strategy and sustainability plan is included in the design. As mentioned above we talk about using local teachers and having the support of the local community (P9) which all support sustainability. And speaking of Do No Harm–are there any steps or measures in the guide to help ensure AEPs are conflict sensitive? There are steps and measures in the guide under the principles to help ensure AEPs are conflict sensitive; for example under P4 ‘Curriculum, materials and pedagogy are genuinely accelerated, AE-suitable and use relevant language of instruction’ we mention the importance of language relevancy; under P6 ‘Educators are recruited, supervised and remunerated’ we talk about recruiting educators from target geographic areas, building on learner’s culture, language and experience and under P7 ‘AE Centre is effectively managed’ we mention that the centre management committee (e.g. PTA), should be representative of the community but we do not overtly mention AEP’s should be conflict sensitive and have specific measures in to ensure this. Because of the contexts that AEP’s operate in I think we should add this into final version of the pocket guide. In the DRC (kivus) , the MOE and the ministry of social affairs are both supporting the ALPs and have problems coordinating of course. The advantage of having the Ministry of social affairs manage the ALP is that they bring more health messaging and practices and safety environments. Any suggestion?